The Wall Street Journal did a little digging and found out that many independent T-Mobile dealers have something to worry about if the merger with AT&T goes through. The latter has said that some of the savings they expect to have after the deal closes will come from closing stores and rationalizing advertising and back office personnel. That goes with the territory after any merger, and while AT&T has said that it looks forward to working with T-Mobile's independent dealers "in a manner that is mutually beneficial", a realistic look at the situation shows that many T-Mobile stores are near an AT&T location. 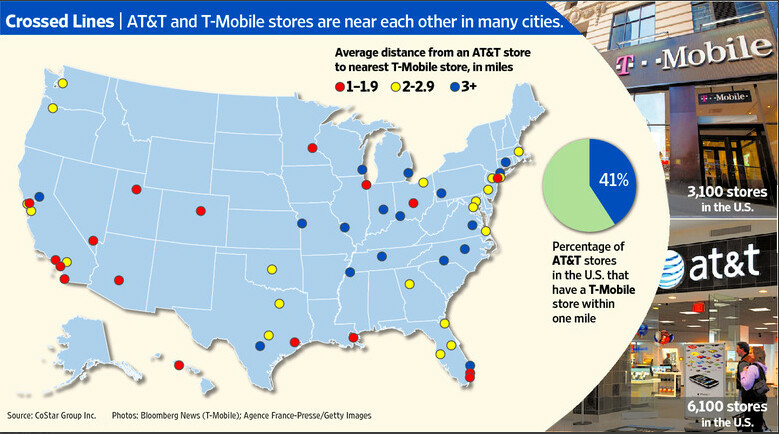 According to the WSJ, AT&T and T-Mobile together operate 9,200 stores and 41% of AT&T locations are within 1 mile or less of a T-Mobile location. The West is where the worst congestion is, especially in cities like Denver, Salt Lake City, Phoenix, Las Vegas and Los Angeles. That information comes from real-estate firm CoStar Group, paid by the WSJ to research the locations of both carriers. Despite the merger, T-Mobile is still planning on adding over 200 independently run stores this year, and to help those dealers, the company is paying the leases on some of the locations to help the independent owner alleviate some of the risk. Overall, T-Mobile has 2,000 company owned stores and 1,100 independently run locations. AT&T has 2,300 company owned stores and 3,800 independent ones. Different parameters will determine which stores will be closed or contracted. Todd Heiner owns 80 T-Mobile stores through his Express Locations LLC, and thinks he has a better shot at keeping his locations as opposed to someone running 5 stores. Obviously, though, a store's performance is of utmost interest. Doug Chartier, T-Mobile’s senior vice present for nation accounts and business sales, says that if the deal closes, AT&T is going to look at the portfolio of T-Mobile locations and ask, "...what are the ones with the highest returns and the highest value?" Whatever AT&T decides, you know that for third party owners of T-Mobile locations, it is not going to be pretty. I really wanna see what this deal will cause. most likely thousands of lay off...thats what always happen when there is a merger. and the people working for tmobile will be the ones getting screwed the most. Yeah we have two T-Mo stores in one of our malls. Come to think of it, we have a corporate VZW and an indirect VZW in that same mall. Okay so I'm gonna go all "in this economy". Really though in this economy laying off people would only further weaken our economy in many major cities, no? So who on the FCC actually thinks this merger is a good idea right now? It'll only give the heads more money and f**king the lower class over again. No one is winning in this deal except the big wigs. Nextel and Cingular was gone, next will be T-Mobile and Sprint. ATT and Verizon will the main wireless carriers in America. The plans will be high cost and limited data plans. ATT and Verizon are very expensive service plans already. 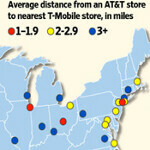 I hope ATT plans will match T-Mobile plans in price after the merger. Your hopes shall be crushed like a wild targ in an open field. First off I think people posting need to get their info correct. AT&T is Cingular Wireless. Cingular still exists. Baby Bell SBC bought out their parent company AT&T and Cingular Wireless joint venture (SBC and Bell South) bought out AT&T Wireless. After that SBC bought out its partner Bell South and took the name of AT&T b/c is was a globally recognized thus changing Cingular Wireless to AT&T. So in the end of it all it's Cingular whos buying out T-Mobile.